Friday Five is a weekly series at QAspire where I curate five articles (with excerpts)/quotes/tweets/visuals shared on my personal learning network each week that I found particularly useful, and hopefully you will find some of them valuable too! This edition features insights on the softer aspects of leading others and why they are so important and on how streams are changing the way we lead and learn. 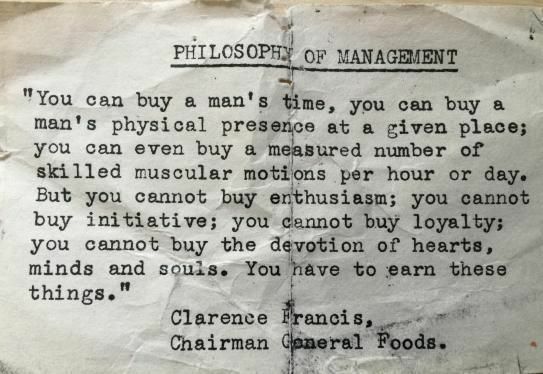 This note sums up the underlying philosophy of management and leadership. The key however is to know, how to earn these things. That, according to me, is the #1 challenge of leadership today. Being nice is not just about more effective teamwork; it’s related to doing what we can to establish what Margaret Wheatley has called “islands of sanity” in a world that may feel increasingly mean-spirited and ugly. At the risk of sounding a bit of a little old-fashioned, there is nothing wrong, and everything right, with bringing more kindness into our lives (that includes our working lives). This brilliant piece by John Wenger talks about something we so badly need today in society, families and organizations – genuine compassion, care and love. A must read! If the three most desirable things in a world defined by organizations are location, location and location, in the networked world they are connections, connections and connections. Our perception about reality is formed and altered by the streams we follow. This essay sheds light on how these social streams of updates, information and knowledge coupled with our own ways of consuming them are altering how we solve problems. As IT and business leaders, CIOs bear responsibility for finding ways to offer their people opportunities for learning and continual reinvention. This means letting employees take developmental and stretch assignments, providing a great deal of project-based work, and rewarding managers not only for execution but also for coaching and development. A focus on culture, development, and leadership can pay off in more ways than one can imagine. So much research we have proves that softer issues like culture, leadership and development are vital for getting and engaging the right talent and yet when we see around, we know we have a long way to go. Trust is the lubrication that allows organisations to tackle tough problems. It helps them weather the storms of uncertainty. It is also the glue that keeps a team from despair and fragmentation. It keeps an organisation aligned when other forces are trying to pull it apart. This excellent short post by Walter McIntyre outlines the essentials of “I See You” Management – a great way to build mindset of acceptance, understanding and trust!